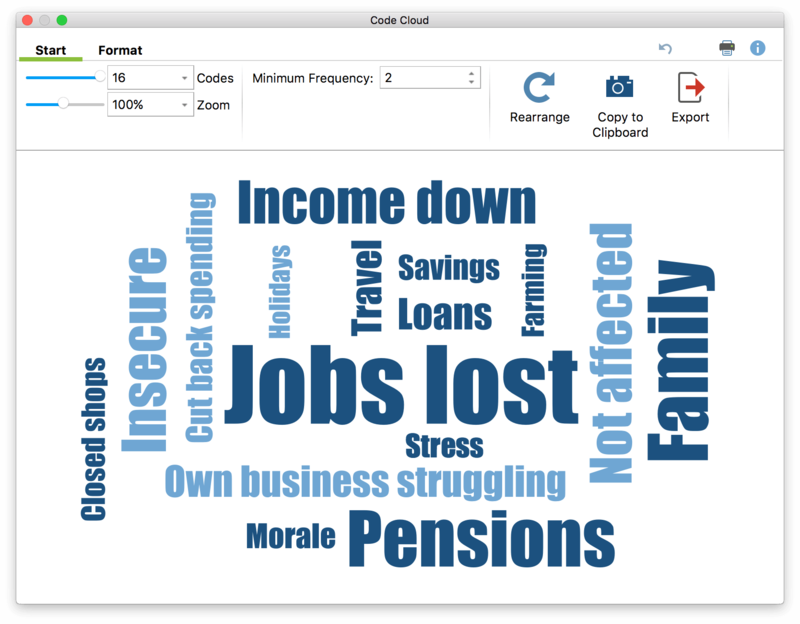 Code clouds are used to visualize the most frequently assigned codes as word clouds. They are particularly suitable for exploring and illustrating the use of codes in a project. The code cloud can represent the codes used across all the documents in a project or only a selection of them. You can generate a word cloud for a single document, for a document group, for a document set, or for all documents in a project. Right-click on the appropriate level in the “Document System” and select the entry Code Cloud. Alternatively, you can also access this function via Codes > Code Cloud in the main ribbon menu. A dialog box will appear in which you can select the required documents and codes. The entire code name is always displayed and can therefore consist of several words, as in the example in “income down”. The Minimum Frequency option in the Start tab refers to the number of codes assigned in the selected documents. Some functions of the word cloud, such as “word frequencies”, the “stop list” and “ignore numbers” are not available, since these do not make logical sense in the case of a code cloud.